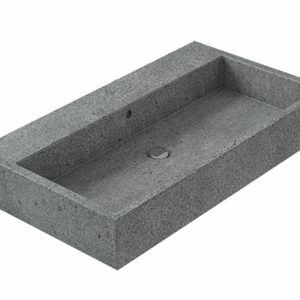 Basin 60cm arranged for three tap holes. Provided with overflow. Wall-hung, sit-on installation or on piece of furniture. Fixing kit included. 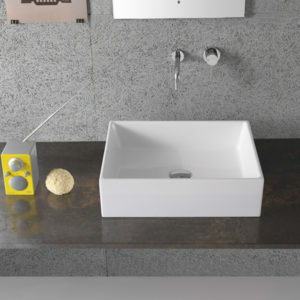 Basin 80.50 h14 cm. Sit-on installation. Fixing kit included. Gray peperino or travertine finish. Basin 90.50 h14 cm. Sit-on installation. Fixing kit included. Gray peperino or travertine finish. 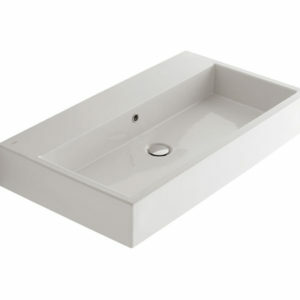 Basin 60 cm. No overflow. 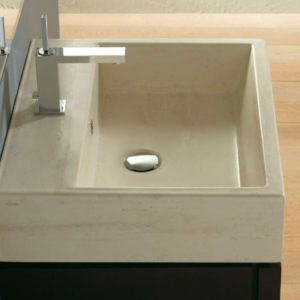 Suitable for wall mounted taps or on counter. Sit-on installation. Fixing kit included. Forty3 has been created by matching the decisive features of contemporary architecture and essentiality. 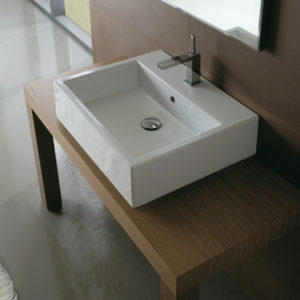 It is a comprehensive selection of washbasins, WC and furniture. 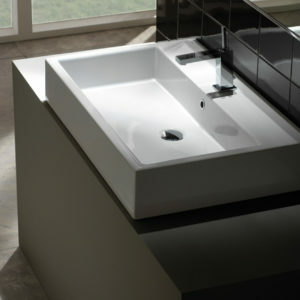 Its design is characterized by linear and contemporary shapes. 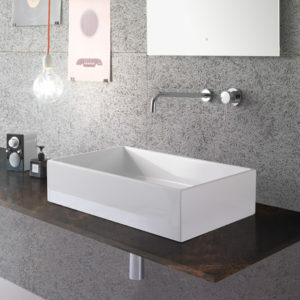 All washbasins can be installed in different ways: wall-hung, sit-on, recessed, semi-recessed, under-top and on furniture installations. 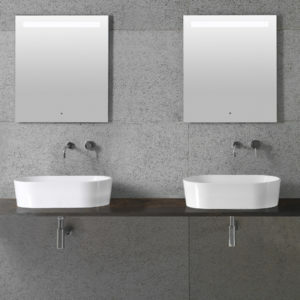 Wall-hung WC include both the version of 52 and 57 cm deep and the version of 43 cm created for small spaces. The Floor-mounted version, available in the 52 and 57 cm sizes, is the first and leading-edge item on the market to have the innovative hidden fixing system FISSAGGIOGHOST ®, which enables to eliminate all fixing holes, improving considerably the aesthetics of the product. 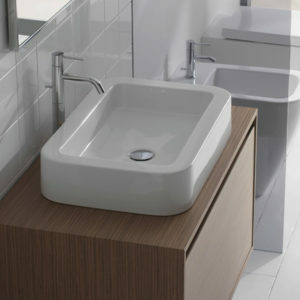 VASOMULTI ® and BIDETMULTI ® system is available in the floor-mounted version of 57 cm. 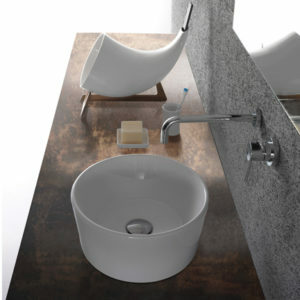 GLOBO’s first-rate quality is highlighted by the elements belonging to the CLASSIC Collection. 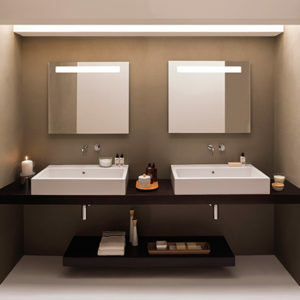 The drawing of these items is characterized by the peculiar quadrangular shape as well as the presence of sharp corners. 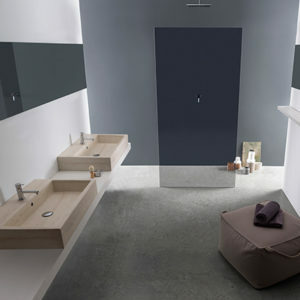 Collection is characterized by 10 different basins can be provided with a peculiar front towel rail. Both wc and bidet are available in the wall-hung version only, characterized by a reduced height and are installed by means of a specific hidden fixing system.